The OM-CP-PRTEMP1000IS is a rugged pressure recorder that accurately monitors and records pressure and temperature at user programmable reading intervals. The OM-CP-PRTEMP1000IS has been Factory Mutual certified as intrinsically safe for Class I, Division 1, groups A, B, C and D and non-incendive for Class I, Division 2, groups A, B, C and D. This certification makes the device ideal for uses in hostile environment applications such as air conditioning systems, chilled water, hot water, air, gas, oil and steam pressure systems. The internal temperature sensor provides accurate temperature measurements without the need of a separate temperature recorder. The logger can be started to take measurements as often as every two seconds, up to one reading every twelve hours. It will store up to 16,383 readings in its non-volatile memory. 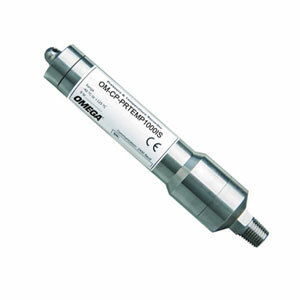 The OM-CP-PRTEMP1000IS uses a rugged stainless steel pressure strain gauge to accurately measure the pressure. The device comes standard with a common 1/4 " NPT fitting, which allows the logger to be adapted to almost any pressure fitting. There are many different pressure ranges available to suit most any application. The OM-CP-IFC200, sold separately, includes Windows software and a USB communication cable. The software converts your PC into a real time strip chart recorder. Data can be printed in graphical or tabular format and can be exported to a text or Microsoft file. for Class I, Division 2, groups A, B, C and D.
참고: Operator’s manual is included with the OM-CP-IFC200 Windows software and USB interface cable, (required to operate the data logger and sold separately). Contact our sales department to order a data logger with NIST calibration certificate.